Recently returned from a visit to Sachkhand Sri Hazur Sahib. This was the last residing place for the Tenth Guru. The journey was enjoyable, and the time spent very gainfully. I wished I could stay a few more days. Jan pārbarahm jā kī nirmal mahimā jan ke cẖaran ṯirath kot gangā. Immaculate and pure are the praises of the humble servants of the Supreme Lord God; the feet of His humble servants are equal to millions of Ganges (sacred shrines of pilgrimage). Man manḏar ṯan ves kalanḏar gẖat hī ṯirath nāvā. The Lord’s Name enshrined within, my mind has become a temple. My body is the simple cloth of the humble seeker; and my home is the bathing of a sacred pilgrimage. Ŧirath nāvaṇ jā▫o ṯirath nām hai. 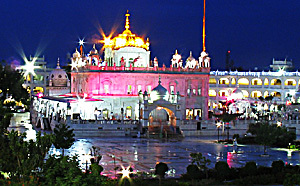 Lets all bathe at sacred shrines: The Naam, the Name of the Lord, is the sacred shrine of pilgrimage. Ŧirath sabaḏ bīcẖār anṯar gi▫ān hai. My sacred shrine of pilgrimage is contemplation of Divine Words, which leads to spiritual wisdom within. all the sins committed are washed off. The True Guru is the Perfect Pilgrimage, Who remains ever absorbed in the Lord’s Name – night and day. So, what does this mean? Should we not visit physical places of pilgrimage like Hazur Sahib? We should because our mind has not yet been purified, and needs to understand the Guru’s Word. However, when we are at a place of pilgrimage, we should engage in these True Pilgrimage activities and not just enjoy visiting and babbling. Sikhism is perhaps unique in this respect. Dear Hardeep, a very meaningful discussion with apt quotes from the Holy Granth.It is believed by some that“Life is a pilgrimage. The wise man does not rest by the roadside inns. He marches direct to the illimitable domain of eternal bliss, his ultimate destination.”GBU. Sure, your own blog is also very nice. Will do a read when I have some more time.